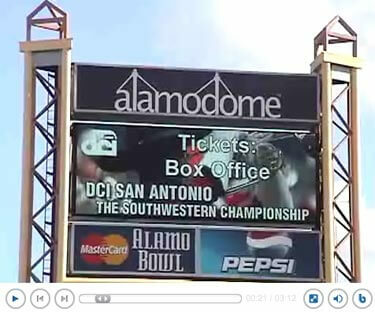 Watch the San Antonio pre-show version of DCI's video magazine "The Beat"
July 22, 2006 – San Antonio, Texas. – Drum Corps International is Deep in the Heart of Texas and host Steve Rondinaro welcomes y'all to the DCI Southwestern Championship. Rondinaro invites all music instructors attending the Texas Bandmasters Association on Sunday, July 23, to the Drum Corps International booth on the convention floor. The DCI video crew will be setup there looking for directors to interview in the "hot seat" for the upcoming full-length version of the "The Beat."